Want to try something different? 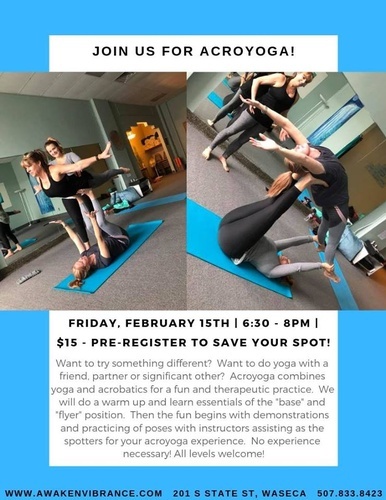 Want to do yoga with a friend, partner or significant other? Acroyoga combines yoga and acrobatics for a fun and therapeutic practice. We will do a warm up and learn essentials of the "base" and "flyer" position. Then the fun begins with demonstrations and practicing of poses with instructors assisting as the spotters for your acroyoga experience. No experience necessary. All levels welcome! $15 - Pre-register to save your spot!